The 5 Bar 6 Ranch is an extraordinary legacy ranch for sale located in the Mill Creek drainage of Montanas famed Paradise Valley. At the crossroads of incomparable luxury and unspoiled wilderness, the 5 Bar 6 offers sanctuary from the outside world yet is just 25 miles from downtown Livingston. World-class amenities (for family or corporate functions), sterling recreational attributes and extensive adjoining Gallatin National Forest lands create a grand vacation lifestyle accessible all year round. Approximately 2 miles of pristine Mill Creek flow through the ranch offering exceptional trout fishing. 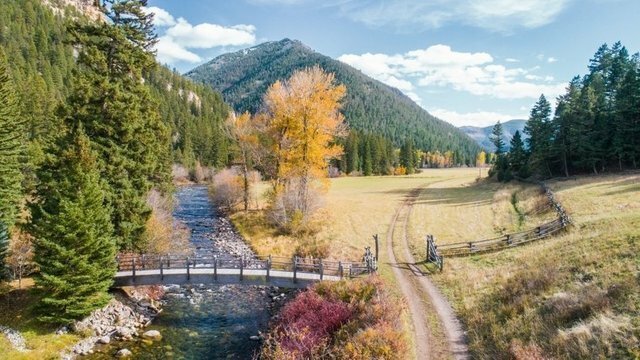 Scenic forests, irrigated meadows, wetlands, bountiful wildlife and striking views of snow-capped mountain peaks dominate this magnificent +/- 240-acre recreational ranch. It is no wonder the 5 Bar 6 Ranch was the location of scenes from the film, "A River Runs Through It." Steeped in history, with abundant natural resources, the 5 Bar 6 Ranch has been passionately cultivated and transformed over the years into an impressive example of timeless harmony and western elegance. All improvements have been carefully integrated into the natural landscape creating a special family or executive compound. All dwellings combined include 17 bedrooms and 18.5 baths. This is a place where memories will be made for generations to come. Nestled at the base of Chico Peak in a serene and private setting is the exquisite western style dwelling designed by acclaimed architects, Jonathan Foote and Paul Bertelli. Featuring +/- 13,000 square feet, 8 bedrooms, 12 bathrooms, two gourmet kitchens, a 1000-bottle wine cellar, butler's kitchen, game room, home theater (with seating for 18) and multiple dry stacked Montana stone fireplaces. A striking outdoor living area includes a heated Infinity pool & hot tub, +/- 9700 square feet of stone patio with outdoor grill, food prep area, bar and fireplace. Stellar equestrian facilities complete the compound. The executive home has warm and cozy living areas coupled with light-filled airy spaces. Every amenity you can imagine exists here. Aesthetic sensibilities extend beyond high-end expectations, yet this is an authentic and beautiful creation that is unique and above comparison. The stone wing was added in 2003 to include a sophisticated private space emulating an industrial-style with steel-framed windows and finely detailed craftsmanship of the late 19th and early 20th century arts and crafts movement. The allure of this setting is evident by its forested back drop, panoramic view of Mill Creek, striking vistas of Arrow Peak, Knowles Peak and The Pyramid, a mighty 10,700-foot peak. The Counts Creek Guest House was designed by Jonathan Foote, and built by On Site Management in 1994 with wood that sat on the ranch from a calving barn. It was the first new construction on the ranch. Counts Creek runs under the house into a pond which has a liner (Pond by Urbani and Associates). The house is full of natural light and wonderful finishes including a glass hallway that showcases the running creek below. Approximately 2,163 square feet on one story accommodates 2 bedrooms, 2-3/4 bathrooms, an open cooks kitchen, dining and living area with a grand stone fireplace, mud room with stacked washer, dryer, and forced-air heat (2 furnaces). Above the kitchen is a small loft. Large windows overlook the pond and stone patio facing the mighty mountain peaks. Off the back of the house is a private patio with built-in BBQ. Pegs Cabin was built on the 5 Bar 6 Ranch in 1945 in a forested area near the executive home. In 2003, it was stripped down to the framing and remodeled by On Site Management. The cabin is approximately 819 square feet with 2 bedroom suites (each with a 3/4 bathroom), a wood shake roof and is built with round logs. An elevated 408 square foot deck extends the outdoor living area. Heat is supplied by forced-air supplemented by a gas stove. Domestic water is from the well that also services the executive house. The +/-2,163 square foot managers house perfectly situated right after the bridge entrance was designed by Jonathan Foote, and constructed by On Site Management in 1994. This inviting home is 2 stories high with 3 bedrooms, 3 baths (1 full, 1-3/4, and powder room), living room, kitchen/dining area, office, large bonus room, forced air heating, and a beautiful stone fireplace. There is also a 3-car attached garage plus a tractor stall, two small riding arenas, corals, hay storage and a storage shed. The grounds are beautifully landscaped. Contact Tracy Raich - Exclusive Broker for a full Brochure.